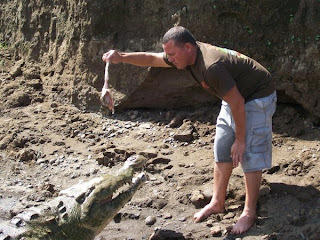 Home » Blog » Blogs » Have You Ever Fed a Crocodile? 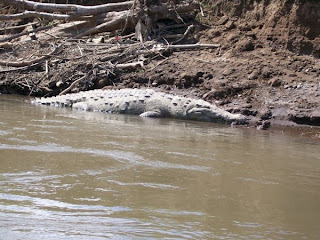 Tarcoles River, a popular hot spot close to Jaco Beach, live over 2000 American Crocodiles. The majority of them reach lengths of 12 feet and can eat a dog in one gulp. Plus, they have been known to eat a cow or two from the surrounding farms. But looking down a bridge wasn’t enough for us, we wanted to get up close and personal! We decided to take the Crocodile Man Tour. The tour is best known for the Great Feeding Show where the experienced guides feed the crocs with the same casual ease as we do when feeding a friendly dog. Our guide knew all the crocodiles by name: Saddam Hussein, George Bush, and Bill Clinton. These guys are the biggest and ruled these waters. We hung out with Bill Clinton. He was definitely over twelve feet long, and weighed about half a ton, at least. Looking at his mammoth jaw all I thought about was it snapping shut on me. 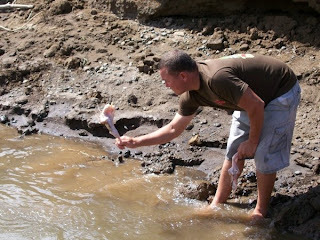 The guide however didn’t shiver at that gruesome thought and instead grabbed a raw chicken and hopped off the boat. Next he started hitting the water with the chicken as the crocodile made its way over to him. Instead, though, of throwing the dead bird into its mouth, and being done with it, he began teasing him. This show of superiority lasted for a good five minutes as the crocodile’s body leaped higher and higher out of the water until the guide finally gently handed over the chicken and strolled back to the boat. Now that’s what I call a show! Marina has been living in Central America for over 7 years and her site Travel Experta is all about traveling in Central America. Marina loves to help people plan the perfect vacation to this amazing part of the world! You can sign up for her RSS feed and join the fun on her facebook fan page and follow her on Twitter at @MarinaVillatoro.